This 7-piece set is the perfect size for cutting cheese to top a cracker. Also makes festive bite-size fall cookies. This versatile porcelain platter works well for this wreath-shaped cheese platter; place a small bowl in the center to hold relish or spread. This platter is also great for holding a pizza or cake. It's microwave, oven, and dishwasher safe, too. 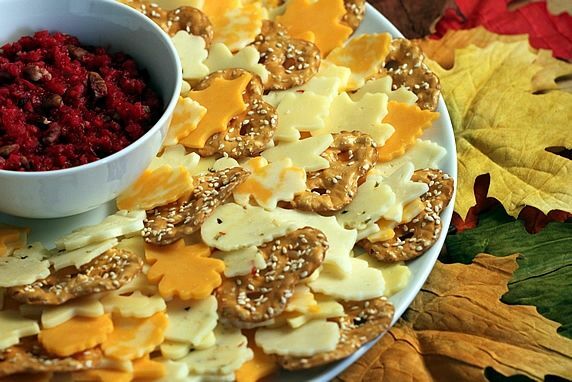 This is an easy, festive way to serve cheese at a fall party. Along with fresh cranberry ginger pear relish, it's a winner! 3 lbs. sliced cheese--a variety of colors, white, orange, mixed, jalapeno. 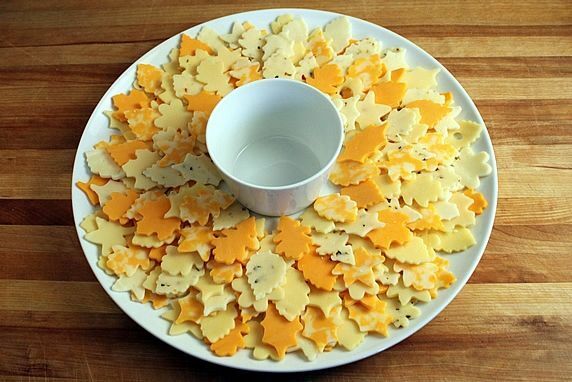 Cut the cheeses with leaf cookie cutters. Place bowl for relish in center of round platter to save a place for it. Beginning on outside edge, add cheese leaves to platter; vary the colors and shapes as you add the leaves, spiraling the layers toward the center of the platter. Remove bowl and cover tightly with plastic wrap. Refrigerate until serving time. (This can be prepared up to 2 days ahead.) 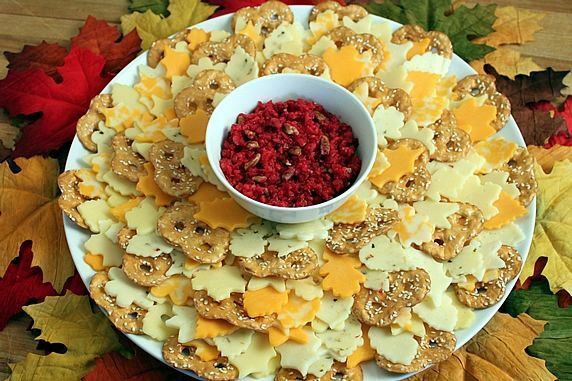 At serving time, return bowl to center of cheese leaf wreath, fill with relish, and serve with crackers. Optional: Just before serving, gently lift some of the cheese leaves and insert crackers underneath them. 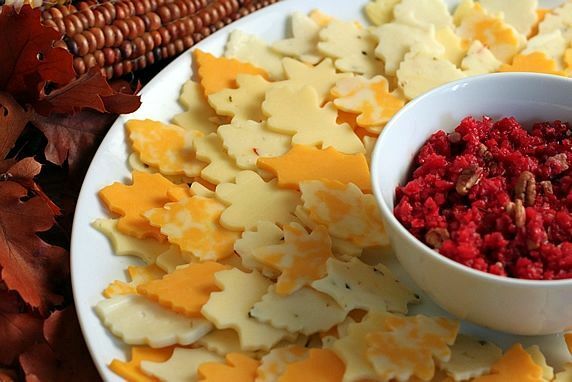 I love the colors of fall leaves, and this is a fun, festive way to celebrate fall leaves on a cheese platter. After Mary, a colleague of King-Man, shared this idea with me, I added it to our next party menu. An added bonus of this party platter is that it can be prepared at least 2-3 days ahead. No last minute panic! 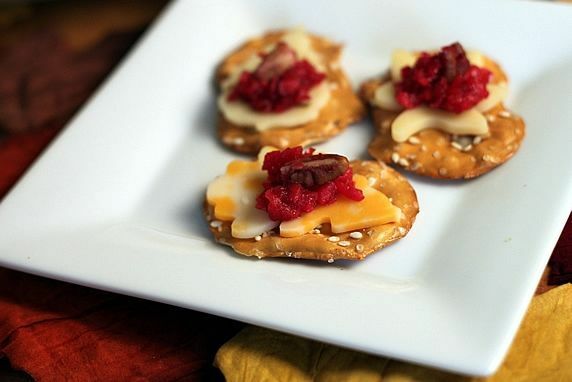 I served the cheese with pretzel crackers and my cranberry ginger pear relish. The sweet-tart relish is a tasty contrast to the salty cheese and crackers. I show how to make the relish in my post, Cranberry Ginger Pear Relish and Classic Cranberry Sauce. Other garnishes will work, too. An olive tapenade is a nice choice if you prefer a savory garnish. Trader Joe's has a red pepper & artichoke relish that's delicious. 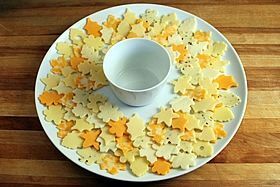 Just so you know, although this is really, really easy to do, it does take awhile to cut the cheese into leaf shapes. Plan for about an hour of cutting time. First, purchase approx. 3 lbs of a variety of sliced cheeses. To mimic changing leaf colors, you want a variety of cheese colors: orange, white, mixed, jalapeno. 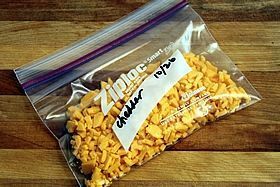 You may find what you need with packaged cheeses at the grocery. If not, have the deli counter slice a variety of cheeses for you. 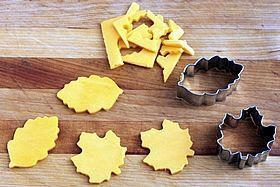 You also need small fall leaf cookie cutters. I got these at Amazon. Grocery stores and Walmart may have something similar. 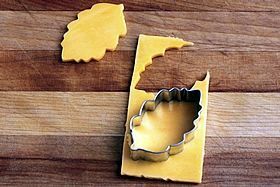 They are the perfect size to cut the cheese to fit on a cracker--no bigger than 2 to 2-1/2 inches. Now it's time to start cutting the cheese. It couldn't be easier. 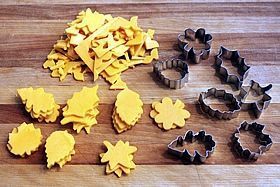 Simply cut the sliced cheese into leaf shapes with the cookie cutters. 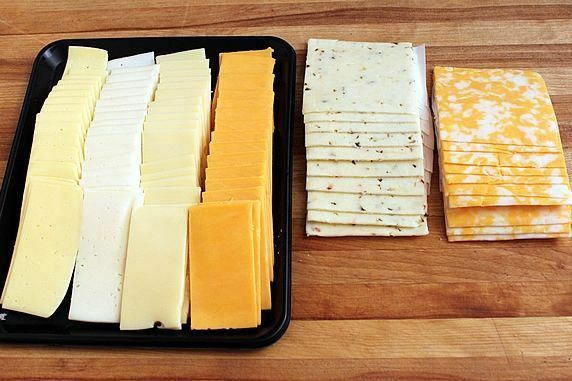 Cut a variety of shapes of each kind of cheese. 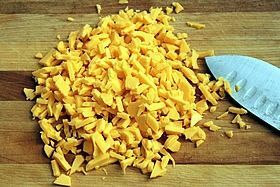 Give the leftover cheese a few chops with a knife and store it for future use in casseroles, omlettes, tacos, nachos, pizza, or any place you would use shredded cheese. Repeat this process for each type of cheese. As I cut my cheese, I kept it sorted by type/color so that it would be easier to distribute the colors and shapes on the platter later. You will need a round platter or plate if you want a wreath shape. 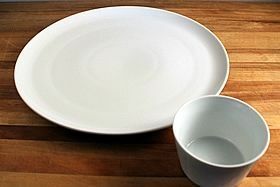 I used a 14-1/2 inch platter. 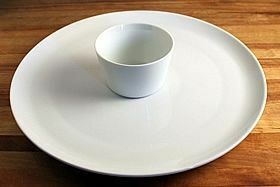 Place the bowl you will be using for relish in the center of the platter to save a place for it. Begin placing cheese leaves around the outside edge of the platter first. Mix up shapes and colors as you proceed around the platter. Continue adding layers of cheese leaves, spiraling around and gradually moving towards the center of the platter. Make ahead tip: If you are making your platter ahead, remove the bowl and wrap the cheese platter tightly with plastic wrap. 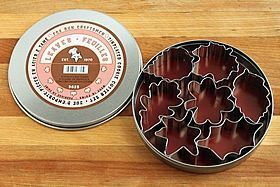 This can be made and refrigerated at least 2-3 days in advance. When it's time to serve your cheese platter, remove it from the fridge, and fill the bowl with relish or another garnish. Here's my finished cheese leaf wreath with cranberry ginger pear relish. What easy, festive finger food! 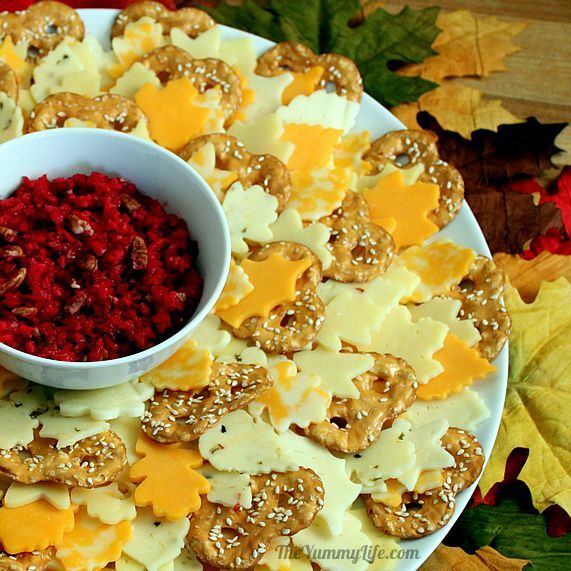 Here's another option: Add some pretzel crackers to the platter before serving it. 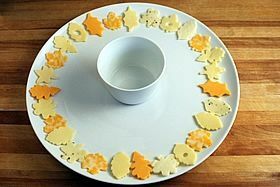 They have a woody look that makes them fit with the leaf theme of the platter, and the contrast of the crackers and cheese makes the leaf shapes show up better. If you add crackers like this, don't do it too far in advance or they will loose their crispness. Wait until serving time, gently lift the cheese leaves and tuck pretzel crackers underneath. It doesn't take long and can be done at the last minute. 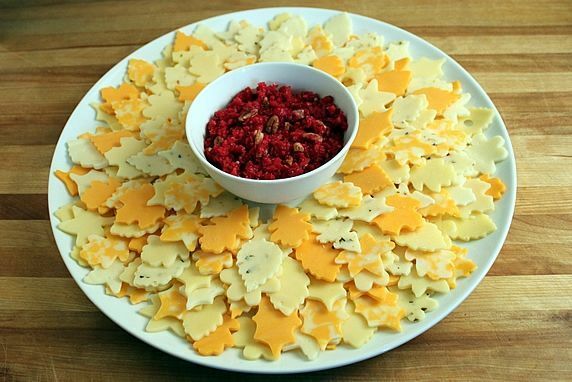 I love the festive look of this cheese platter. It's both food and decoration for your table.